President Donald Trump said in a tweet Sunday that he's working to give China's ZTE "a way to get back into business, fast." Jobs in China are at risk, he said. ZTE (ZTCOF), a smartphone and telecom equipment maker that does business around the world, announced last week that it has halted its main operations after the Trump administration banned American companies from selling it vital components. Now, Trump says he's working with President Xi Jinping of China to get the company back on its feet. "Too many jobs in China lost. Commerce Department has been instructed to get it done!" Trump wrote in a tweet Sunday. The US Commerce Department did not immediately respond to multiple requests for comment Sunday. The White House later issued a statement indicating that President Trump "expects" Commerce Secretary Wilbur Ross "to exercise his independent judgment, consistent with applicable laws and regulations, to resolve the regulatory action involving ZTE based on its facts." The Chinese government welcomed Trump's comments. 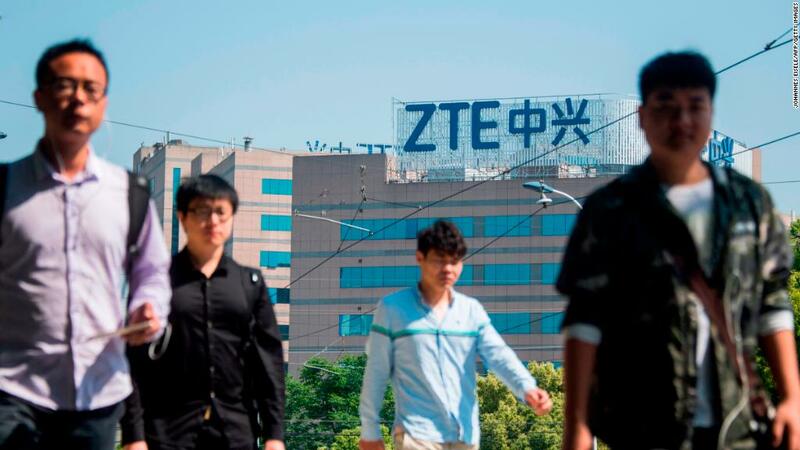 "We very much appreciate the positive statement from the US side on ZTE and maintain close communication with them on the issue," Foreign Ministry spokesman Lu Kang said Monday. ZTE's current struggles have made it the most visible consequence thus far of a brewing trade war between the United States and China. The Chinese company employs about 75,000 people. It's also the fourth largest provider of smartphones in the United States. Last month, the Trump administration blocked American firms from selling parts or providing services to ZTE until 2025. The ban was put in place after Washington said ZTE violated a deal struck last year in which ZTE agreed to pay a $1.2 billion fine for violating US sanctions on Iran and North Korea. ZTE denies it violated the deal and is appealing the export ban. The company warned in April, when the ban was first implemented, that it would "severely impact the survival and development" of ZTE. Experts say the company could be circling the drain, but some have predicted a deal will be reached with the US government enabling it to survive. The US crackdown on ZTE has been interpreted by some as part of a broader push by the United States to stifle China's tech ambition. But ZTE has also long been the target of scrutiny for regulators and officials in the United States, which is wary of its ties to the Chinese government. The company's controlling shareholder is Shenzhen Zhongxingxin Telecommunications Equipment, a Chinese state-owned corporation. One 2012 congressional report about ZTE and Huawei, another huge Chinese tech company, said the companies "cannot be trusted to be free of foreign state influence and thus pose a security threat to the United States and to our systems." Both companies strongly disputed the report's findings. Adam Schiff, a Democratic congressman from California, responded to Trump's tweet Sunday, saying he "should care more about our national security than Chinese jobs." "Our intelligence agencies have warned that ZTE technology and phones pose a major cyber security threat," he said. Trump didn't mention it, but the Commerce Department's ban on ZTE is also affecting American companies. The Chinese firm's suppliers of smartphone chips include Qualcomm (QCOM) and Intel (INTC). It also buys parts for telecoms equipment from smaller American companies like Acacia (ABGLF) and Oclaro (OCLR), which have been hit particularly hard by the ban. Trump has repeatedly blasted China for what he calls unfair trade practices. And a looming trade war between the United States and China has been punctuated by both nations threatening billions of dollars worth of tariffs against the other. On Sunday, Trump appeared to ease the rhetoric, saying the countries "are working well together on trade." "But past negotiations have been so one sided in favor of China, for so many years, that it is hard for them to make a deal that benefits both countries," he said in a tweet. "But be cool, it will all work out!" — CNN's Julia Horowitz, Steven Jiang and Boris Sanchez contributed to this report.